In South Korea, one out of every two mobile subscribers now has an LTE device, according to new data from GSMA Intelligence, but what’s even more interesting is the difference in how 3G and 4G subscribers used their connections in that country. Since SK Telecom(s skm) launched its first LTE network back in the second half of 2011, data usage on 4G phones has more than doubled, while data consumption on 3G devices has remained flat. The conclusion may seem a bit obvious since people who buy newer, fancier smartphones tend to gravitate toward more data-intensive applications, but GSMA Intelligence lead analyst Calum Dewar thinks there’s more to the trend. South Korea has reached critical mass in both coverage (100 percent of the population is now under the 4G umbrella) and speed, leading to consumers changing their behavior. In particularly, Dewar pointed out that many Korean wireless users have stopped hunting for Wi-Fi connections, choosing instead to keep their connections on the LTE network. 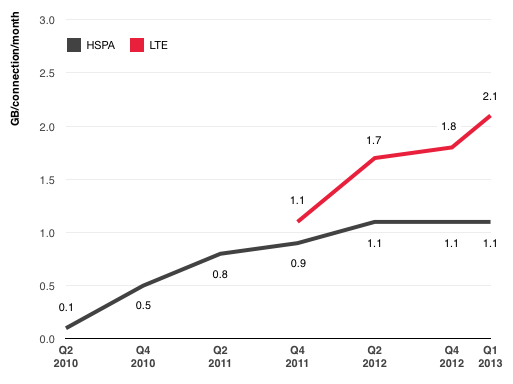 The GSMA noted the same trend in other countries where LTE is now entrenched. In the U.S., Verizon(s vz)(s vod) reported in Q3 that 38 percent of its connections were LTE, but the LTE network hosted 64 percent of its total data traffic. In Germany, O2 reported in Q3 that 4G smartphone usage is triple that of 3G smartphones. While data consumption seems to be increasing everywhere LTE is present, not every region is seeing a subsequent boost in data revenues. Dewar noted that in mature LTE markets such as the U.S. and Korea, operators are seeing their customers sign up for increasingly expensive data plans, but that’s not yet happening in Europe. In the U.K, Everything Everywhere is seeing slight increases in average revenue per subscriber when customers transition over to an LTE device, but in France average bills are in free fall even as 4G takes root.